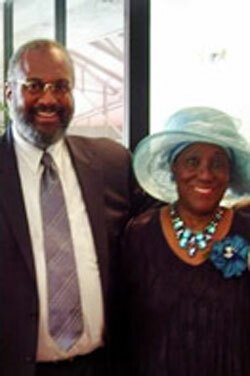 Renowned sculptor and Professor Frank Eugene Tobias Martin II of Atlanta, Ga., pictured with his mother Laura B. Martin of Lauderhill, Fla., died April 25, 2012, and he was surrounded by his wife, mother and children. Viewing will be held Friday, May 4, 2012 from 7 to 9 p.m. at Murry Brothers Funeral Home, 1199 Utoy Springs Road Southwest in Atlanta, Ga. 30331. Call (404) 349-3000 for more information. Funeral services will be held at 10 a.m. at Spelman College, 350 Spelman Lane Southwest, Atlanta, Ga. 30314. For more information (404) 681-3643. A Memorial Service in Fort Lauderdale, Fla., is still pending.